Background: Acne vulgaris is a common chronic disorder of the pilosebaceous unit. Topical therapy is the mainstay of treatment for mild-to-moderate acne. Two main problems with conventional anti-acne treatments are antibiotic resistance and local side effects. In this regard, medicinal herbs could be an alternative choice for developing new products with fewer side effects. Objective: The purpose of this study was to evaluate the safety and efficacy of a topical formulation of cinnamon in patients with facial acne. Method: In this open-label, assessor-blind, and uncontrolled clinical trial, 20 patients (18F/2M) with mild-to-moderate facial acne were treated with topical cinnamon gel twice-daily for eight weeks. 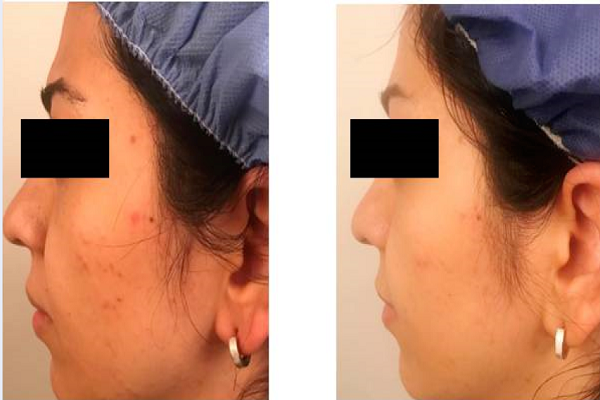 The outcomes of acne lesion count, red fluorescence parameters and skin biophysical profile were evaluated at baseline, 4th and 8th week. For safety assessment, any adverse drug reaction was recorded during the study. Results: Two months after using cinnamon gel, there was a significant reduction in the total (47%, p=0.000), inflammatory (42%, p=0.026), and non-inflammatory (48%, p=0.002) lesion count. Also, the size of red fluorescence spots was significantly reduced (p<=0.05). In skin biophysical measurement, there was a significant decrease in erythema (61.31+/-68.25), sebum (31.05+/-36.15), and hydration (10.05+/-10.16), as well as a significant increase in pH (0.63+/-0.75). Some patients experienced mild, transient erythema and burning immediately after applying the gel, but no serious side effects were reported. Conclusion: Our results suggest that topicalcinnamongel is efficient and safe for the treatment of mild-to-moderate facial acne. Acne vulgaris is a chronic dermatologic disease involving blockage and/or inflammation of pilosebaceous unit 1. It is characterized by non-inflammatory (comedone) and inflammatory (papule, pustule, and nodule) skin spots which mainly appear in the sebum-rich areas (face, back, and chest) 2. Most people experience this situation at some point in their lives, especially during puberty 3. Facial disfigurement in this disease has negative effects on self-image and self-esteem of patients 4. Although acne vulgaris is not a life-threatening condition, the psychological burden of this disease can be as high as disabling diseases 5. It seems that an interaction among the following factors is involved in the pathogenesis of acne: increased sebum production by pilosebaceous glands, keratinocyte hyperproliferation, colonization of certain bacteria (especially Propionibacterium acnes, i.e. P. acnes) in hair follicle, primary perifollicular inflammation, and inflammatory responses to P. acnes metabolites, cell debris and/or sebum 6. As for therapy, topical therapy is the mainstay of treatment in mild to moderate acne 7. However, two main problems with conventional topical drugs are antibiotic resistance and local adverse reactions 8. Therefore, medicinal plants are promising agents for developing new anti-acne products with fewer side effects 9. In Persian and Greek medicine, a long list of herbs has been mentioned in the literature for dermatologic conditions, such as acne. One of these herbs recommended by Avicenna for the topical treatment of facial spots is known as Dārčīnī (Cinnamon) in the Canon of Medicine 10. The anti-bacterial, anti-inflammatory and anti-oxidant effects of cinnamon species have been documented in the current scientific literature 11,12,13,14,15. Therefore, this medicinal plant can potentially target several factors related to acne pathogenesis. Despite traditional and current evidence for anti-acne properties of cinnamon, no relevant clinical study has been conducted until now. The aim of the present pilot study was to investigate the safety and efficacy of a topical formulation made from cinnamon bark for the treatment of mild-to-moderate acne vulgaris. Cinnamon bark was purchased from a local market (Tehran, Iran). Carbomer 940 was obtained as a gift sample from Janus Pharmaceutical Company (Iran). Triethanol amine, EDTA and propylene glycol were obtained from Merck (Germany). Propylparaben and methylparaben were bought from Alborz Bulk (Iran). Ethanol was supplied from Alcohol Arak Company (Iran). Deionized water was freshly prepared, whenever it was necessary. The medicinal plant was authorized by the Faculty of Pharmacy, Tehran University of Medical Sciences. Cinnamomum verum (C. verum) barks were placed in a mechanical grinder just prior to extraction of essential oil. The essential oil was extracted from 500 ‌g of ground powder by hydrodistillation using clevenger apparatus for 3 ‌‌hours. The obtained essential oil was light yellow with a pungent odor and had a density of 0.98 mg/mL. It was collected in a glass container and kept in a refrigerator (4±1˚C), protected from light until use. (4) all materials were combined and mixed by a stirrer (IKA, Germany) at 400 rpm for 2 min. After that, a few drops of triethanolamine was added to the solution to form a gel. The formulation was filled in 15 g aluminum tubes. The prepared gel was evaluated for color, odor, consistency, and homogeneity. The viscosity of gel was evaluated by a DV1TM digital viscometer (Brookfield, Spain) using spindle 5 at 100 rpm with a run time of 15 seconds. About 2 g of the gel was dissolved in 20 ml of distilled water, and the pH was determined by pH meter (Metrohm 827, Switzerland). The formula was quantified based on trans-cinnamaldehyde (CA) as the main component of the cinnamon essential oil. Trans-cinnamaldehyde (analytical standard) was purchased from Sigma-Aldrich (St. Louis, MO, USA). The calibration curve of CA was plotted for quantification of the compound in the sample. Different concentrations of CA (1-32 µg/mL) in methanol (HPLC grade; Merck) were prepared and injected into the gas chromatography (GC) instrument. The analysis was performed using an Agilent 6890 series system (Agilent Technologies, PA, USA) equipped with a HP-5 capillary column (30 m × 0.25 mm id, with film thickness of 0.25 m). The initial column temperature was equal to 40◦ C which was increased up to 250◦ C with a rate of 3◦ C/min. Helium was used as the carrier gas at a constant flow rate of 1 mL/min. Electron ionization was used as the detector and the area under the curve (AUC) of the concentrations were recorded. Each sample was injected three times into the instrument. The equation (Y=68.178X+1.6269, R2=0.9996) was obtained by plotting concentration against the mean AUC of the standards. Ten grams of the gel was dispersed in 30 ml of distilled water and extracted three times by 30 ml of n-hexane using a decantation funnel. The n-hexane fraction was diluted by n-hexane into 100 ml in a volumetric flask. Then, 10 mL of the diluted sample was dehydrated over anhydrous sodium sulphate and was injected into the GC instrument. The mean of the AUCs for three different injections was plotted in the calibration curve of CA for the quantification of cinnamaldehyde in the sample. This open-labelled, assessor-blind, uncontrolled clinical trial was performed between September 2017 and April 2018 in the Center for Research and Training of Skin Diseases and Leprosy of Tehran University of Medical Sciences, Tehran, Iran. The study protocol was approved by the Research Ethics Committee of Tehran University of Medical Sciences (approval number of IR.TUMS.REC.1394.2063) and registered under irct.ir identifier: IRCT2016031126938N3. This study was conducted according to the ethical considerations of the Declaration of Helsinki and Good Clinical Practice (GCP). All subjects provided informed written consent before entering the study. Twenty patients (aged 20-60 years old) with mild-to-moderate facial acne were included in this study. Acne severity was determined by counting the number of papules and pustules per half face: 0–5: mild, 6–20: moderate, 21–50: severe, and >50: very severe 16. Eligible patients signed the written consent form and applied the cinnamon gel to the affected area of the face twice-daily for two months. Concurrent use of any topical or oral anti-acne medications were not allowed during the study. The primary outcome measure was acne lesion count (total, inflammatory, and non-inflammatory). Secondary outcome measures were the size and quantity of follicular fluorescence spots, and skin biophysical parameters. All outcomes were evaluated at baseline, 4th and 8th week. Fluorescence photography was conducted using Visiopor® PP 34 camera (Courage- Khazaka, Germany) with narrow-band UVA light (375 nm) and image size of 6×8 mm. Photographs were taken from the left cheek. The number, size, and intensity of the orange-red fluorescence spots were analyzed in the related software. Six skin biophysical characteristics were measured using MPA-5 Cutometer (Courage-Khazaka, Germany). Stratum corneum hydration, sebum content, transepidermal water loss (TEWA), and skin pH were measured by Corneometer CM 825, Sebumeter SM 815, TEWAmeter TM 300 and pH-Meter PH 908, respectively. The erythema index and melanin index were measured using Mexameter MX 18. All measurements were performed on the left cheek in a room at 20–25 °C temperature and a relative humidity of 35–50%. Treatment-related adverse drug reactions were recorded throughout the study. Finally, each participant’s satisfaction with the treatment was measured using a visual analogue scale (VAS) of 0 (completely unsatisfied) to 10 (completely satisfied). Statistical analysis was performed using SPSS software16. Quantitative data were expressed as mean ± SD. A paired T-test with a significance level of 0.05 was used for comparison between baseline and post-treatment values. The gel had a mild yellowish color, cinnamon odor, and homogenous character. The pH of the gel was 4.51, the density was 0.86, and viscosity was 800 cp. The formulation was stable during the clinical study, based on the physical assessment. Cinnamaldehyde content of the gel was 0.38±0.02% (w/w). Figure 1 . Mean lesion counts at baseline, week 4 and week 8. Figure 2 . Digital photographs, at baseline (a, c) and 8 weeks (b, d) after treatment with 0.5% cinnamon gel. Figure 3 . 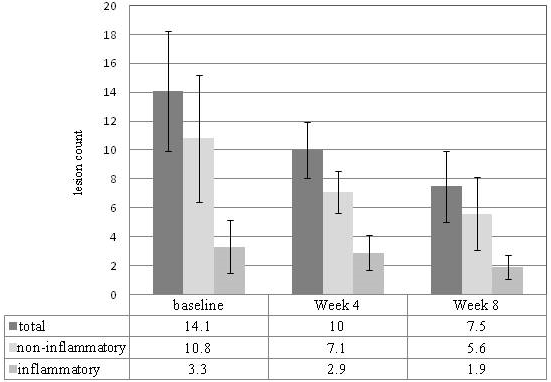 Mean value of fluorescence digital photography parameters at baseline, 4 th and 8 th week after treatment. For safety assessment, we used repeated open application test (ROAT) and skin biophysical measurement. Here in the study, 15 healthy volunteers applied topical 1% cinnamon gel on a 3 × 3 cm site on the flexure surface of their right forearm twice-daily for one week. The left forearm served as the control. The subjects were asked to determine the severity of the side effects as mild (did not have to stop treatment), moderate (had to stop treatment for a short while), and severe (had to stop treatment soon after beginning). After one week, there was no significant difference between the mean changes in biophysical parameters values of the right and left forearm (Table 1). Adverse reaction to 1% cinnamon gel was seen in 6 subjects as follow: severe erythema, burning and itching (1 case), moderate erythema and burning (1 case), and mild erythema (3 cases). Thereafter, the test was repeated with a 0.5% (w/w) cinnamon gel. The observed side effects of this gel were mild burning and erythema (3 cases) and mild erythema (2 cases). According to lesser side effects, 0.5% (w/w) cinnamon gel was used in this trial. In the clinical phase, 20 patients (18 females, 2 males) completed the study. The average age of the patients was 21.4 ± 3.4 years old (range: 20–40 years old). Eight weeks after treatment, a mean decrease of 47% (from 14.1 ± 4.4 up to 7.5 ± 2.46) in total lesion count, 48% (from 10.8 ± 7.3 up to 5.6 ± 3.6) in non-inflammatory lesion count, and 42% (from 3.3 ± 2.4 up to 1.9 ± 1.7) in inflammatory lesion count were seen (Figure 1). The observed reductions in the number of total (p = 0.000), non -inflammatory (p = 0.002), and inflammatory lesions (p = 0.026), versus baseline, were statistically significant (p ≤ 0.05). Of the 20 patients, 7 showed greater than 50% relief (Table 2). The clinical effectiveness of the cinnamon gel is shown in Figure 2. At week 8, the mean decrease in sebum content (31.05 ± 36.15; P = 0.001) and erythema index (61.31 ± 68.25; P = 0.001) were significant compared with baseline. Additionally, the results showed a significant decrease in skin hydration (10.05 ± 10.16; P = 0.000) and a non-significant increase (3.84 ± 3.69; p = 0.063) in TEWA. Eventually, there was a non-significant increase (4.48 ± 25.5; p = 0.442) in melanin index and a significant increase (0.63 ± 0.75; P = 0.001) in skin pH. The mean value of six skin biophysical parameters at baseline and two follow-up visits are summarized in Table 3. At the end of the study, the mean decrease in the percentage area covered with red fluorescence spots (size) and number of red fluorescence spots (quantity) were 0.39 ± 0.77 (P = 0.034) and 3.4 ± 7.35 (P = 0.052), respectively (Figure 3). The mean VAS score of patient satisfaction with efficiency of the cinnamon gel was 5.98 ± 1.14. No serious adverse events were reported for the trial. Thirteen patients complained of mild burning and 11 patients reported facial redness after using the cinnamon gel for a maximum of ten minutes. The severity of these symptoms was not intolerable to stop the treatment and most of the patients stated that the intensity of these side effects was decreased after a week. Acne vulgaris is one of the most common chronic skin diseases 3. Since the available anti-acne treatments are not completely satisfactory and safe, finding new alternative efficient treatments with fewer side effects for acne treatment is necessary. Considering the multifactorial pathogenesis of acne, use of medicinal plants with multiple mechanisms of action could be promising 9. In the present study, we investigated the clinical efficacy and safety of a topical cinnamon gel for the treatment of mild-to-moderate facial acne. The results of this pilot study showed that topical cinnamon gel significantly decreased the count of inflammatory and non- inflammatory acne lesions. Additionally, there was also a notable decrease in the size and quantity of red fluorescent spots. The red fluorescence emission from pilosebaceous follicles correlates with the amount of porphyrin 17. Porphyrin is a metabolic product of P. acnes; inhibition of P. acnes can lead to a decrease in porphyrin production 18. A significant decrease in skin erythema and sebum content after using the cinnamon gel was another finding of our study. Sebum hypersecretion is a major pathogenic factor for acne lesion formation. 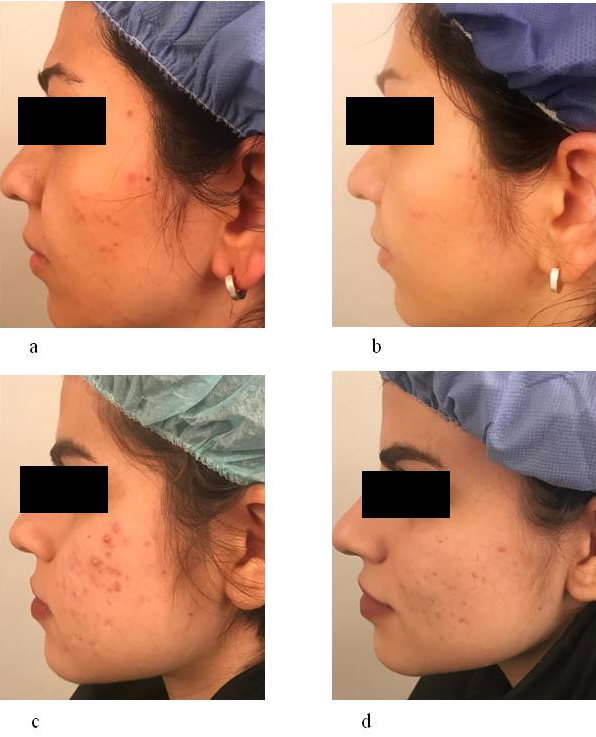 Excessive sebum (by plugging the pilosebaceous duct) provides an anaerobic lipid-rich environment for the growth of P. acne 19. An inflammatory response of innate and adaptive immune systems to P. acnes is considered as the next pathogenic factor 20. In this process, the release of reactive oxygen species (ROS) and inflammatory mediators from immune cells induce cellular damage and inflammation in acne-prone sites 21. Considering the aforementioned mechanisms, it is rational to choose an anti-acne product which has anti-bacterial effect against P. acnes, as well as anti-inflammatory and anti-oxidant effects 22. Anti-bacterial activity of cinnamon against P. acnes has been documented in several in vitro studies 23,24,25. A recent study revealed that the inhibition zone diameters of C. verum bark extract (90%) and tetracycline (250 µg/mL) against P. acnes were 17.2 and 18.9 mm, respectively 26. In another study, the inhibition zone of Cinnamomum zeylanicum bark essential oil at 25%, 50%, and 100% concentrations were 16.7, 26.7, and 31.3 mm, respectively, compared with the inhibition zone of vancomycin which was 17 mm 25. Furthermore, cinnamon has strong antioxidant activity 27. The results of another in vitro study on antioxidant activity of C. verum bark extract showed that ROS scavenging capacity was comparable to synthetic antioxidants 14. These therapeutic effects are mainly attributed to cinnamaldehyde, which is the major (62%–90%) chemical constituent of cinnamon bark. In addition, cinnamaldehyde has anti-inflammatory effects, such as blockage of PGE2 production, suppression of synthesis, and dissemination of inflammatory mediators (e.g. IL-1β, IL-6 and TNF-α), and reduction of ROS release from immune cells 28. In most of the patients, the cinnamon gel was well-tolerated, and there was no serious adverse events. However, some patients experienced mild transient skin irritation especially over the first week of trial. Cutaneous allergic reactions to topical cinnamon formulations are documented in several case reports 29,30,31,32. Therefore, cinnamon formulations should be used with caution, especially in patients with a history of allergic reaction to cinnamon species. Although no patient complained of dryness, there was an increase in TEWL and a significant decrease in hydration values in skin biophysical measurement. There was also a significant increase in skin pH, but it remained in the acidic range. Given that appropriate epidermal water content and acidic pH are necessary for skin barrier anti-microbial defense 33, long-term follow-up studies are needed to assess the changes in these parameters. In conclusion, preliminary results revealed that cinnamon gel can be an effective topical treatment for mild-to-moderate acne. These therapeutic results have been most probably attributed to sebostatic, anti-bacterial, and anti-inflammatory activities of C. verum bark essential oil, as well as its major compound cinnamaldehyde. This is the first trial to investigate the clinical effectiveness of cinnamon for the treatment of acne vulgaris. To confirm these findings, further clinical trials with control groups and larger sample sizes are needed. Mehdi Vazirian was the principal investigator and edited the manuscript. Saman Ahmad Nasrollahi designed the drug formulation. Ziba Talebi & Maedeh Ghovvati contributed in data acquisition, pharmacognostic and pharmaceutical Part of the study. Alireza Firooz supervised the clinical part of the study. Gholamreza kordafshari & Mehrdad Karimi have done patient collection. Aniseh Samadi performed statistical analysis. Sima Kolahdooz prepared and revised the manuscript. All authors read and approved the final manuscript. This research project was supported by Tehran University of Medical Sciences (TUMS) (grant no. 95-01-169-31056). Zouboulis C. C.. Acne and sebaceous gland function. Clinics in Dermatology. 2004; 22 : 360-6 . Masterson K. N.. Acne Basics: Pathophysiology, Assessment, and Standard Treatment Options. Journal of the Dermatology Nurses\' Association. 2018; 10 : S2-10 . Tahir C. M.. Pathogenesis of acne vulgaris: simplified. Journal of Pakistan Association of Dermatologists. 2016; 20 : 93-7 . Gieler U., Gieler T., Kupfer J. P.. Acne and quality of life - impact and management. Journal of the European Academy of Dermatology and Venereology. 2015; 29 : 12-4 . Mallon E., Newton J. N., Klassen A., Stewart-Brown S. L., Ryan T. J., Finlay A. Y.. The quality of life in acne: a comparison with general medical conditions using generic questionnaires. British Journal of Dermatology. 1999; 140 : 672-6 . Degitz K., Placzek M., Borelli C., Plewig G.. Pathophysiology of acne. Journal der Deutschen Dermatologischen Gesellschaft. 2007; 5 : 316-23 . Kraft J., Freiman A.. Management of acne. Canadian Medical Association Journal. 2011; 183 : E430-5 . Yang J. H., Yoon J. Y., Kwon H. H., Min S., Moon J., Suh D. H.. Seeking new acne treatment from natural products, devices and synthetic drug discovery. Dermato-Endocrinology. 2017; 9 : e1356520 . Yarnell E., Abascal K.. Herbal medicine for acne vulgaris. Alternative and Complementary Therapies. 2006; 12 : 303-9 . Sina A. Ibn. The Canon of medicineBeirut: Alaalamy Foundation Publications 2005. Han X., Parker T. L.. Antiinflammatory activity of cinnamon (Cinnamomum zeylanicum) bark essential oil in a human skin disease model. Phytotherapy Research. 2017; 31 : 1034-8 . Lee H. J., Hyun E. A., Yoon W. J., Kim B. H., Rhee M. H., Kang H. K.. In vitro anti-inflammatory and anti-oxidative effects of Cinnamomum camphora extracts. Journal of Ethnopharmacology. 2006; 103 : 208-16 . Mathew S., Abraham T. E.. In vitro antioxidant activity and scavenging effects of Cinnamomum verum leaf extract assayed by different methodologies. Food and Chemical Toxicology. 2006; 44 : 198-206 . Mathew S., Abraham T. E.. Studies on the antioxidant activities of cinnamon (Cinnamomum verum) bark extracts, through various in vitro models. Food Chemistry. 2006; 94 : 520-8 . Mazimba Ofentse, Wale Kabo, Tebogo E, Tebogo E, Kwape Shetonde O. Cinnamomum verum: Ethylacetate and methanol extracts antioxidant and antimicrobial activity. J Med Plants Studies. 2015; 3 : 28-32 . Hayashi N., Akamatsu H., Kawashima M., Acne Study Group. Establishment of grading criteria for acne severity. The Journal of Dermatology. 2008; 35 : 255-60 . Youn S. W., Kim J. H., Lee J. E., Kim S. O., Park K. C.. The facial red fluorescence of ultraviolet photography: is this color due to Propionibacterium acnes or the unknown content of secreted sebum?. Skin Research and Technology. 2009; 15 : 230-6 . Benardon Susanna, Barbareschi Mauro. Fluorescence in acne: a closer view. Journal of the Egyptian Women’s Dermatologic Society. 2014; 11 : 67-70 . Youn Sang Woong. The role of facial sebum secretion in acne pathogenesis: facts and controversies. Clinics in Dermatology. 2010; 28 : 8-11 . Dreno B., Gollnick H. P., Kang S., Thiboutot D., Bettoli V., Torres V., Global Alliance to Improve Outcomes in Acne. Understanding innate immunity and inflammation in acne: implications for management. Journal of the European Academy of Dermatology and Venereology. 2015; 29 : 3-11 . Gaber M. A., Dawood A. A., Mahmoud A. A.. Oxidants and antioxidants role in acne vulgaris. Menoufia Medical Journal. 2014; 27 : 465 . Sahib Ahmed Salih, Al-Anbari Haidar Hamid, Raghif Ahmed R Abu. Oxidative stress in acne vulgaris: an important therapeutic target. Journal of Molecular Pathophysiology. 2013; 2 : 27-31 . Nabavi S. F., Di Lorenzo A., Izadi M., Sobarzo-Sánchez E., Daglia M., Nabavi S. M.. Antibacterial effects of cinnamon: from farm to food, cosmetic and pharmaceutical industries. Nutrients. 2015; 7 : 7729-48 . Chaudhary S. S., Tariq M., Zaman R., Imtiyaz S.. The In vitro anti-acne activity of two unani drugs. Ancient Science of Life. 2013; 33 : 35-8 . Shabani Nor Raihan Mohammad, Ismail Zakaria, Ismail Wan Ismahanisa, Zainuddin Nurdiana, Rosdan NH, Roslan MNF, Mohd Azahar NM. Antimicrobial activity of cinnamon oil against bacteria that cause skin infections. JSRAD. 2016; 3 : 1-6 . Julianti E., Rajah K. K., Fidrianny I.. Antibacterial Activity of Ethanolic Extract of Cinnamon Bark, Honey, and Their Combination Effects against Acne-Causing Bacteria. Scientia Pharmaceutica. 2017; 85 : 19 . Rao Pasupuleti Visweswara, Gan Siew Hua. Cinnamon: A Multifaceted Medicinal Plant. Evidence-Based Complementary and Alternative Medicine. 2014; 2014 : 12 . Chao L. K., Hua K. F., Hsu H. Y., Cheng S. S., Lin I. F., Chen C. J.. Cinnamaldehyde inhibits pro-inflammatory cytokines secretion from monocytes/macrophages through suppression of intracellular signaling. Food and Chemical Toxicology. 2008; 46 : 220-31 . Calnan C. D.. Cinnamon dermatitis from an ointment. Contact Dermatitis. 1976; 2 : 167-70 . Diba V. C., Statham B. N.. Contact urticaria from cinnamal leading to anaphylaxis. Contact Dermatitis. 2003; 48 : 119 . Drake T. E., Maibach H. I.. Allergic contact dermatitis and stomatitis caused by a cinnamic aldehyde-flavored toothpaste. Archives of Dermatology. 1976; 112 : 202-3 . Mathias C. G., Chappler R. R., Maibach H. I.. Contact urticaria from cinnamic aldehyde. Archives of Dermatology. 1980; 116 : 74-6 . Milani M.. Acne, anti-acne therapies and epidermal barrier functions: the role of adjuvant treatments. OA Dermatology. 2013; 1 : 4 . Maedeh Ghovvati, Gholamreza Kord Afshari, Saman Ahmad Nasrollahi, Alireza Firooz, Aniseh Samadi, Mehrdad Karimi, Ziba Talebi, Sima Kolahdooz, Mahdi Vazirian, 2019.